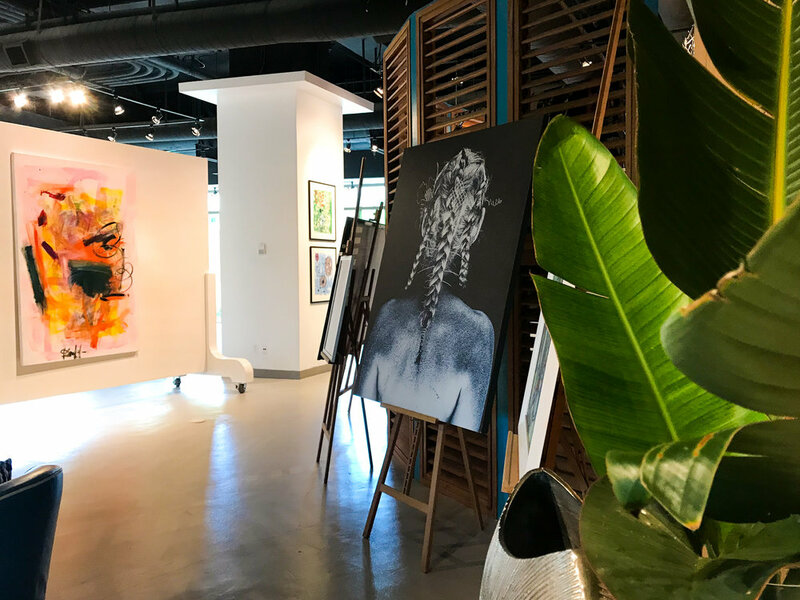 Welcome back to Cacique’s Artist In The Spotlight series - a journey into a thriving Bahamian art scene and a look at some of our most exciting artists, pushing boundaries on island and around the world. In this episode, we tour The Current at Baha Mar with John Cox, the resort's Art Director and renowned Bahamian artist. The Current is a hub for compelling Bahamian artistic experiences and an inspiring, authentic space for intimate meetings and events. John's drive and passion lend to the idea that while The Current may not be the Louvre, it is a unique collective work space that is guaranteed to make you want to take a workshop or host a life-changing brainstorm as much as take home a singular piece of Bahamian art. Shawn M. Sawyer tours The Current and flexes his crafting muscle. Cacique. We are right in the midst of Baha Mar world, nestled between the STRIKING Convention Center and THE wonders of The Current. Talk to us about this space. John. I see it like this - the culmination of these two artistic spaces act as a cultural agency for the entire property. These spaces exist to inject history, culture and heritage of The Bahamas into the guests experience. This space is of great symbolic importance, regardless of a guest’s nationality. In regard to local exposure in particular, the Convention Centre is a huge platform and we have been given the opportunity to transform the pre-function area into a museum. The Fairwind Exhibition is a permanent fixture of Baha Mar, telling of the history of The Bahamas through the eyes of artists. Shawn M. Sawyer and John Cox in The Studio space just outside John's office. C. I think what Baha Mar has done here to allow this platform to grow and develop is absolutely brilliant. To have this space here at the foot of three amazing brands that are going to be enticing thousands of people year-round is fabulous. It truly couldn’t be better positioned. J. I think that from the beginning you need to have a platform in place, one where you can strategically derive secondary platforms from. I think we need to solidify supportive, sustainable methods to do this in other places. I have had my own art practice and I have been an educator in the art world, so for me its important to see each and every phase as a step. I think The Current provides a wonderful opportunity. I feel so lucky to be able to be in a space and facilitate programs here. We aim to broaden definitions. C. So John, the blanker the canvas the better? J. Oh, exactly! Bare with me here but sometimes well-designed less is much more than poorly-designed a lot. We’ve created a modular, dynamic space here in The Current. Right now we are in the gallery space which is the active exhibition area. We predominantly focus on Bahamian artists but not entirely. The overarching concept is to constantly have a rotation of artists represented within the gallery. Exhibitions last for 4-6 weeks. In that time we host an array of events giving the artist maximum exposure. C. So lets imagine meetings in The Bahamas with soul and historical value as opposed to just meeting rooms with tired, commercial art on the walls. J. Exactly. One of the things we are really striving towards at The Current is re-imagining how people see The Bahamas. To do so completely, we feel that the overdone notion of “sun, sand and sea” needs to be elevated to accurately reflect what we offer! We are of course a destination with outstanding beaches and effervescent waters that exist in an endless cycle of summer but we are also busting at the seams with culture, history and interesting characters that need to be unveiled. The Current has the capacity to lure visitors from their Piña Coladas and provide an equally as fulfilling, authentic experience. John Cox and Shawn M. Sawyer begin their tour in the main modular gallery space used to host events, talks and other cultural happenings. One of the main meeting spaces showcasing the modular design. C. I think at the end of the day it would be very short-sighted to have this amazing platform that Baha Mar has extended to the Current only to show classic oil on canvas. I’m thrilled to hear that so many other mediums are used! J. We’ve done a lot in here. We have a great partnership with the Nassau Music Society. We’ve had over 6 of their concerts in here already. It’s been fantastic. The musical evenings attract a really eclectic crowd. It really speaks to what we do within the industry. It’s a great vibe. It allows populations to mix, a powerful fusion of palettes. I think in particular, it gives Bahamians a sense of pride. They have incredible, Bahamian art and artists all around them. C. I couldn’t be more excited to dive into the Current but also to have the Convention Center and the world of business that comes with it so closely connected. There is so much room for opportunity! J. The proximity is something else! The Current is just a few steps away from the Convention Centre and absolutely ideal for large groups to do creative, intimate breakouts. If you want to host different meetings lets say, paint something, print something, listen to a lecturer or watch a short film The Current is able to facilitate in a far more authentic space. Shawn M.Sawyer and John Cox standing in admiration of a screen printing completed in The studio. At Cacique, we love to showcase our colourful Bahamian art scene and the characters that create its distinct flair. For more information on the The Current at Baha Mar, our featured artists and spaces, or to find out about curating a unique look and sound for your event, feel free to contact us.